Laser tag can make people hungry. When families spend the morning chasing each other through the flashing lights of the laser arena at Whirlydome, a family entertainment center in Orlando, Fla., they work up an appetite for pizza, burgers and wings, said Manager Nikita Patel. At Triple Play Family Fun Park in Hayden, Idaho, the menu was recently streamlined to make ordering faster and more efficient. But as at laser tag facilities everywhere, patrons are eager to grab a quick bite and get back to the fun. That’s why pizza, burgers, wings, sandwiches and pretzels are on the menu at most family entertainment centers: The fast, inexpensive, no-fuss menu items allow people to take a break without spending a lot of time and money. 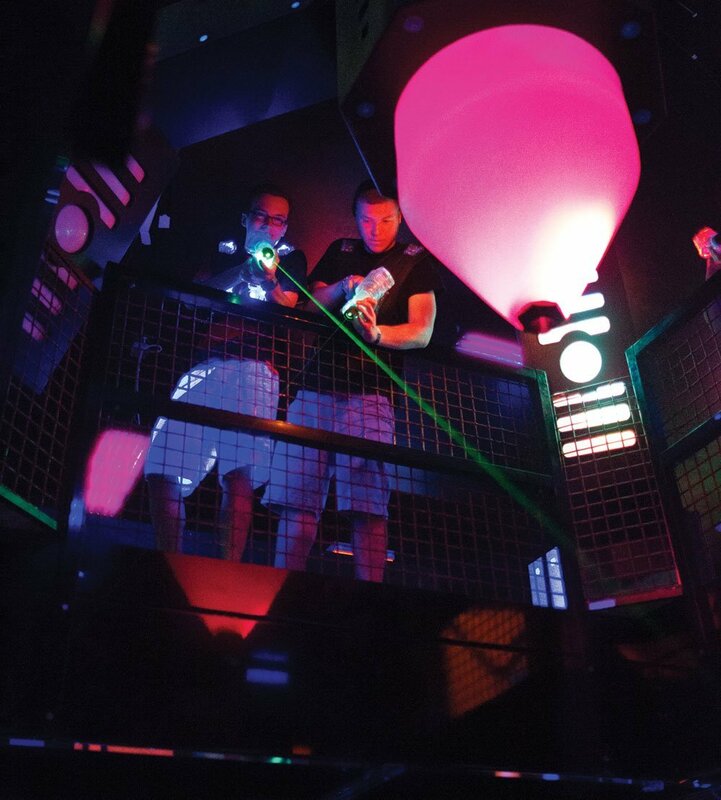 A photo from a WonderWorks laser tag arena. To satisfy hunger and keep the menu simple, the company offers classics such as chicken nuggets, hot dogs, pizzas, pretzels, nachos, popcorn, fries and chicken pitas. 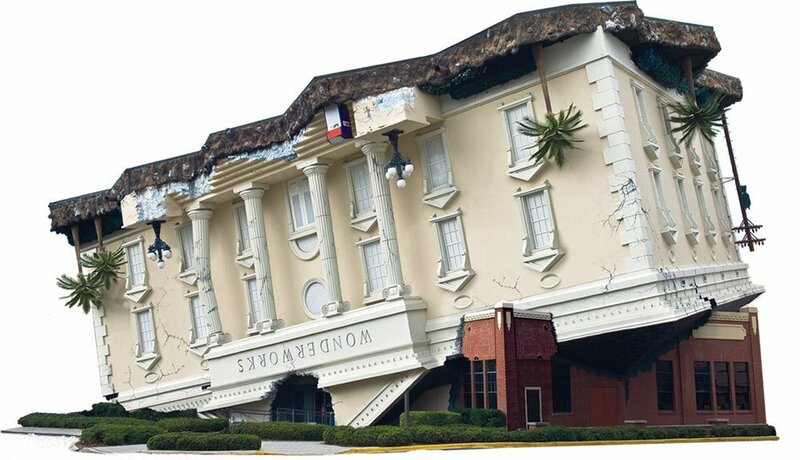 An exterior view of WonderWorks, an Orlando-based family entertainment center with five locations. The Outta Control Magic Comedy Dinner Show, a family-oriented event, sells out nearly every night, according to the corporate sales and marketing coordinator for the chain. 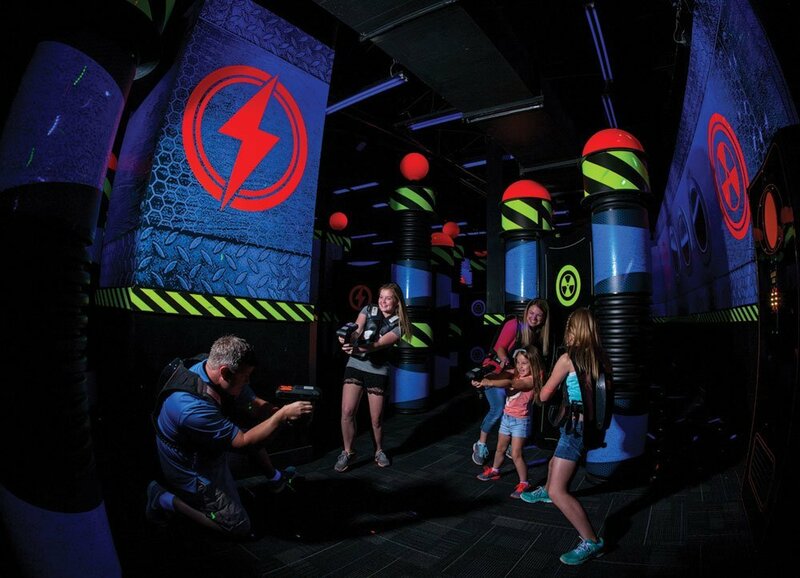 At Triple Play Family Fun Park in Hayden, Idaho, Marketing and Sales Director Jennifer Ross said the menu was recently streamlined to make ordering faster and more efficient for patrons eager to get back to laser tag and the indoor water park. “We felt there were too many options, and people would just stand there and couldn’t decide,” said Ross. Triple Play still has a comparatively large menu: in addition to pizza, burgers, and pretzels, there’s a gluten-free menu with flat bread sandwiches and gluten-free nachos. Healthy eaters can choose from salads, chicken wraps, pastas, and chicken strips prepared grilled instead of fried; patrons can also order side salads in lieu of fries and onion rings, Ross said. However, as many have noted, healthy options are far less popular than fried and cheese-laden classics at laser tag arenas. 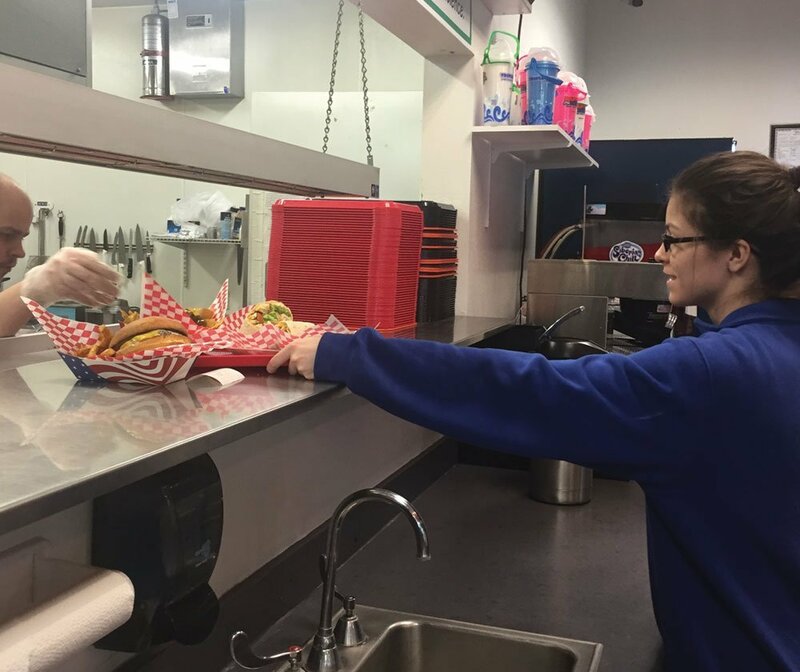 Families out to have fun aren’t in the mood to count calories, which is why at Triple Play, a 16-year-old facility with about 250,000 annual visitors, the most popular items are chicken strips, pizza and burgers, with French fries and pretzels rounding out the best-sellers. “You go to a theme park, you want a burger – they kind of go hand in hand,” Ross said. Rebecca Soy photographed in a kitchen at Triple Play Family Fun Park. Chicken strips, pizzas, burgers, French fries and pretzels are best-sellers for the park. And while the menu was downsized, with the slow-selling fish and chips removed, Triple Play expanded the facility itself with a 9,000-square-foot addition last year that includes the new laser tag arena, a remodeled bumper car area, and plans for an overhauled arcade and party area. A new, three-story rope climbing course has proved especially popular with young adults, many of whom are newcomers to Triple Play – and who stay for the other attractions. At WonderWorks, an Orlando-based family entertainment center with five locations, the meal is the attraction after dark. The Outta Control Magic Comedy Dinner Show, a family-oriented event, sells out nearly every night, according to Erica Lewis, corporate sales and marketing coordinator for the chain. While the regular café menu is the same across all five locations – including Myrtle Beach, Panama City Beach, Syracuse, and Pigeon Forge, Tennessee – the original Orlando location is the only one to boast the all-you-can-eat dinner show that features unlimited pizza, salad, beer, wine, soda and a recently upgraded dessert buffet. “I think that’s a big reason why people come,” said Lewis of the show – whose menu, if fairly basic, offers a complete dinner and a nice evening out for $29.99 ($19.99 for kids) plus tax. “Mostly we’re serving kids. They’re here to grab a snack and go back to having fun,” said the co-owner of Laser Kraze Family Fun Center, which has locations in Ohio and Kentucky. During the day, however, WonderWorks puts the emphasis on hands-on science exhibits, a ropes course, a 6-D motion ride, a recently added forensic science exhibit, and of course, laser tag. “We’re a family attraction – it’s for all ages, but it’s mostly families who do multiple things in one day,” said Lewis. To satisfy hunger and keep the menu simple, WonderWorks offers the classics: chicken nuggets, hot dogs, pizza, pretzels, nachos, popcorn, fries and a chicken pita. While most places keep the menu simple, some – including The Funplex in Mt. Laurel, N. J. – are upgrading and expanding menu options to attract wider audiences. Ayana Davis, a manager at The Funplex, said the attraction has added more sophisticated fare in a bid to become known as a destination for all ages, not just the kids’ birthday parties for which they are famous. The colossal facility, which entertained more than 32,000 children last year just for birthday parties, attracts well over 100,000 visitors annually, Davis said, and will open a new outdoor water park by Memorial Day weekend this year. 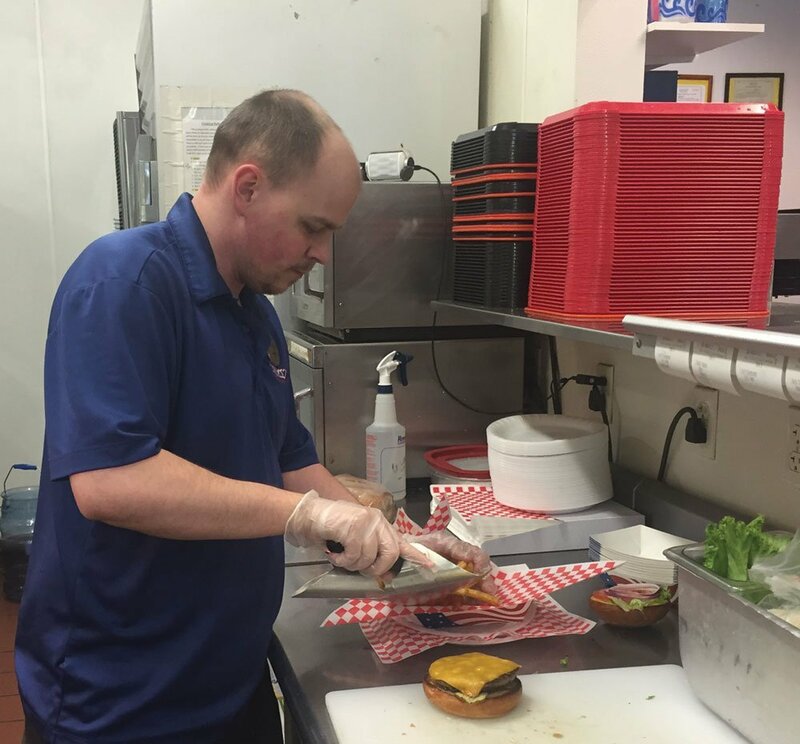 Sam Harris, an employee at Triple Play Family Fun Park, photographed in a kitchen. The center even offers gluten-free items as part of its comparatively large menu. To keep up with demand, The Funplex has added items to the catering menu. They include Italian entrees – pastas, lasagnas, penne vodka, meatballs, chicken parmigiana – as well as coconut shrimp, a hummus trio, an onion ring tower, fried green beans and cheese steak egg rolls, the current top seller on the new menu, Davis said. “We’re trying to make it a range for everyone,” she added.